There are many applications out there that can convert various types of video into formats that are friendly to iTunes and the iPhone, iPod, iPad, or Apple TV. Of those, there’s an interesting subset—including Chris Marrin’s Video Monkey 0.10—that can not only encode files, but also tag them with TV show or movie metadata at the same time. Or, they can simply fill in or update tag information without additional encoding. You’ve ripped a DVD movie you own and want to tag it with cover art, genre, description, release date, and the like; or you’ve ripped a TV-show DVD and want to add episode titles and numbers. You’ve ripped a DVD to a large file meant for the Apple TV, say, and want to convert that to a smaller, iPhone-compatible file without re-ripping. You’ve recorded some shows with an EyeTV-type device and, although those recordings include some metadata, they don’t have everything iTunes needs to sort them nicely. Your DVR decided to shirk its recording responsibilities one night, and you’ve downloaded someone else’s capture of the show you missed (we’ll stipulate that it isn’t available on the iTunes Store). You want to convert unsupported video to a format that iTunes understands. 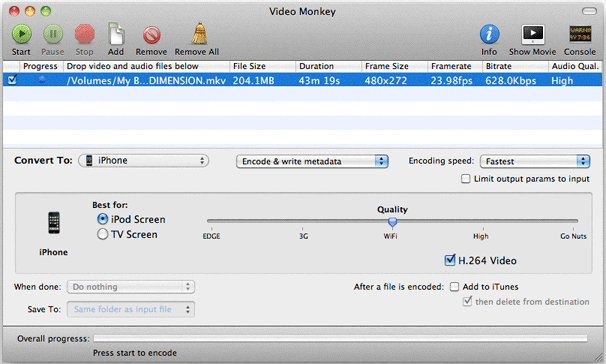 To convert video, Video Monkey takes advantage of the open-source FFmpeg libraries. Video Monkey offers a number of Apple-centric presets, designated by the type of device they’re meant for: All Apple Devices, iPod, iPhone, iPod touch, 1st Gen Apple TV, and 2nd Gen Apple TV. The presets differ in the frame size, frame rate, bit rate, and audio quality they provide. Several of the presets have a Best For area where you can choose between optimizing video for the device’s screen, or for playback on a TV screen (the former limits the frame size to the device’s screen resolution, the latter takes advantage of the maximum size supported by that device). To choose one, just pick it from the iTunes section of the Convert To pop-up menu. Note that the iPhone preset is for all iPhones, and doesn’t take into account the higher resolution of the iPhone 4’s screen (same goes with the iPod touch preset, which doesn’t take advantage of the fourth-generation model’s Retina display). In addition to iTunes presets, there’s also a section called Video Format, which offers presets for AVI, MP4, QuickTime, WMV, Flash, MPEG, and DV. Two other sections—Advanced and Other Conversions—each list a single, grayed-out preset with the words Not Yet Implemented at the end. You can pick the encoding speed—Fastest, Fast, Normal, and Best (2 Pass)—as well as set the quality using a slider. An H.264 Video checkbox lets you choose whether to use the H.264 codec to encode your video for Apple devices (if unchecked, it will use the standard MPEG-4 codec). There’s also an option to have the software send your encoded video to iTunes when completed. For the tagging portion of Video Monkey, the software connects to the thetvdb.com and themoviedb.org sites for TV shows and movie metadata, respectively. In the software’s sparse preferences, you can choose which database to use as your default (the only other option is the maximum number of threads allowed for encoding, from 1 to 8, or Auto). To get Video Monkey to automatically look up metadata based on a file name, you need to go through several steps as a one-time setup. 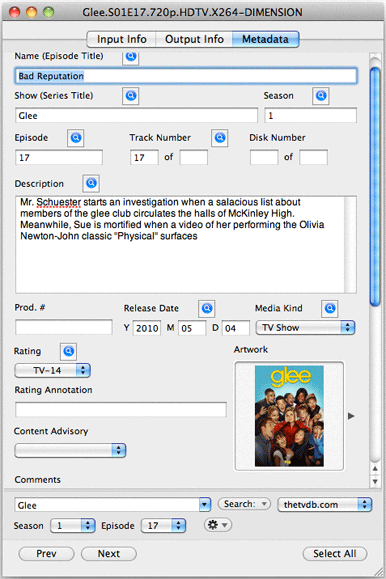 First, you need to add a file, click the Info button at the top of the window, and then click on the Metadata tab. Then you need to click on the Search button and from the pop-up menu that appears, select Auto-Search On Load. If Video Monkey finds the information for your file, it will populate as many fields as it can—for example, TV show episode, TV series title, season, episode number, description, media kind, and so on. This info makes it much easier to organize files in iTunes and on iOS devices, and is similar to what you’d get purchasing content from the iTunes Store. Converting and tagging a 183.5MB, 21 minute and 7 second AVI TV episode to iPhone format (480 pixels wide) with default settings (encoding speed at Fastest, Quality slider in the middle) to H.264 took 4 minutes and 15 seconds. The 98.5MB file looked perfectly acceptable, and Video Monkey tagged it with the proper metadata for the episode. Converting and tagging a 1.17GB, 43 minute and 19 second 720p HD MKV TV episode using the 2nd Gen Apple TV preset with default settings (encoding speed at Fastest, Quality slider set a little at less than one-quarter) to H.264 took 16 minutes and 40 seconds. The file weighed in at 364.4MB with a bit rate of 1.1Mbps, but the quality was only mediocre, with blocky artifacts in several scenes. Bumping the quality up to 50 percent (Standard) took the same amount of time to encode, but the quality was much better (producing a 696MB file at 2.1Mbps). Metadata was added properly. Although the interface might be a little confusing at times (with too many options) and rather plain looking, Video Monkey definitely gets the job done. And for those who don’t like to tinker with video and audio settings, it’s nice to know that if you drop a file into Video Monkey, choose a preset for your target device, and press Start, you’ll end up with a file that works.